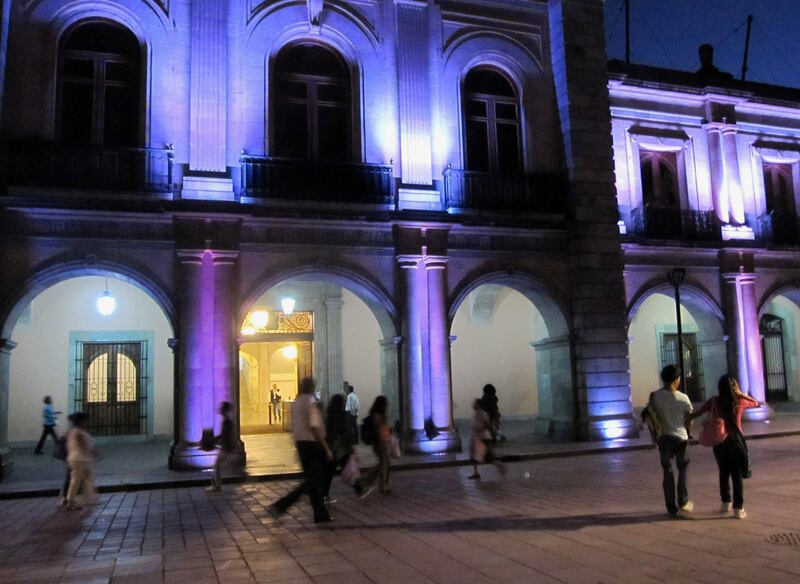 Last week, I posted a Colors of Mexico photo challenge on Mexico Travel Photography, a Facebook group I moderate. We had 45 people take part. I didn’t count the total number submitted, but it was a 5-day challenge. We saw a lot of beautiful photographs of Mexico. Mexico is where anything goes! 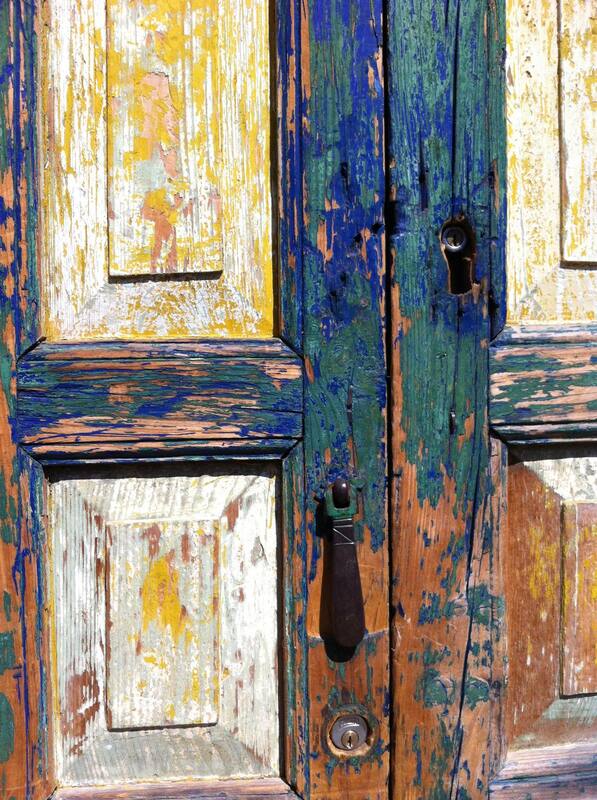 Vibrant color is everywhere. The photographs in this post run the gamut from people, buildings, food, clothing, festivals, markets, street life, re-engineered cars that would have become junk in the USA, and then some. There are literal and figurative photos, abstract and impressionistic. David Taylor shared this photo of live dress-up dolls. As this blog’s writer/editor, I took the liberty of selecting photos to post here that I thought were especially dramatic for the choice of color (or not). Mary Anne Huff Shaw. 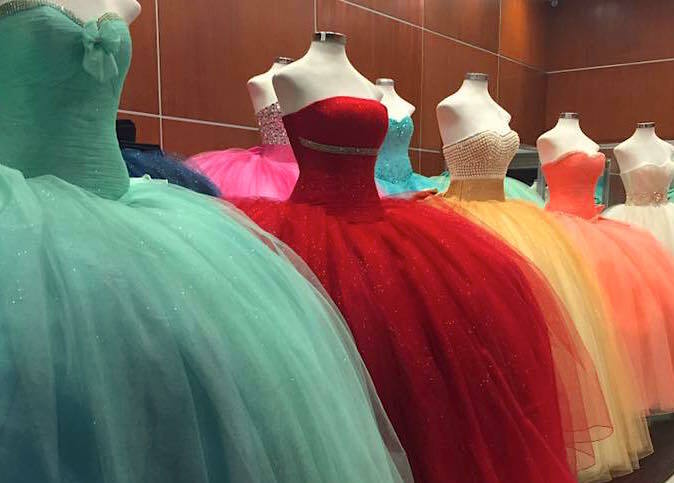 Quinceanera dresses, Mexico City. As editor, I also took some artistic license to crop the original photos submitted on Facebook and do some photo editing enhancements. I used my judgment in this process. Why? Ana Paula Fuentes. 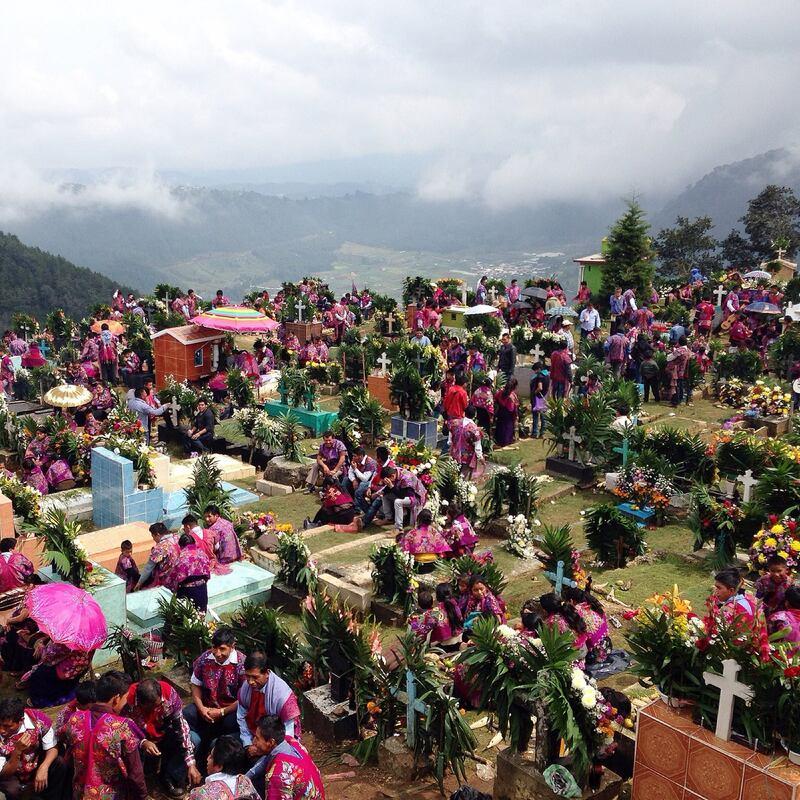 Day of the Dead, Zinacantán, Chiapas. 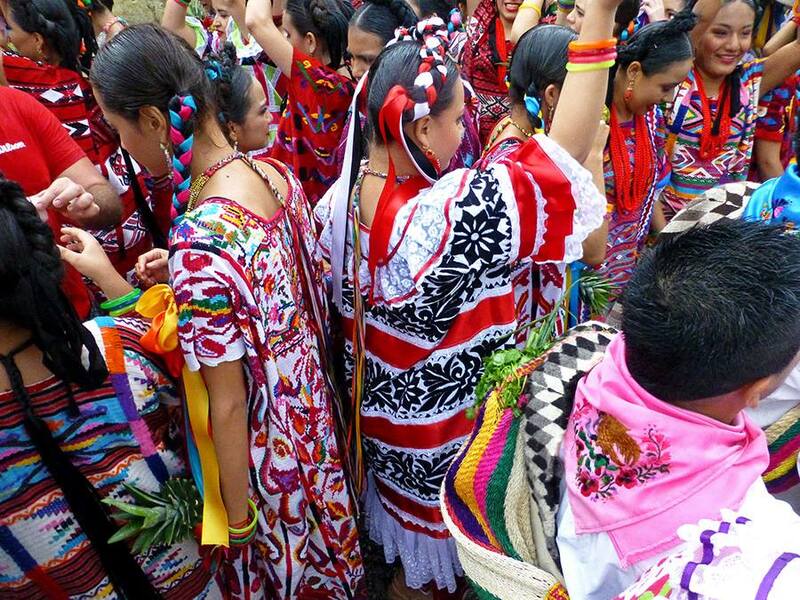 “Sk`in Ch`olelai”in Tzotzil. Sometimes the subject of a photo reveals itself by getting in closer. 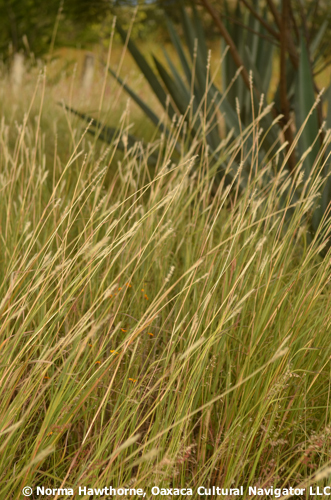 Cropping is all an experiment and depends on each person’s preference. Some people are afraid of doing this, but you can always revert to the original. Nothing lost by trying. If I altered your photo and you don’t like it, please forgive me! Miles De Coster. Oaxaca chickens. 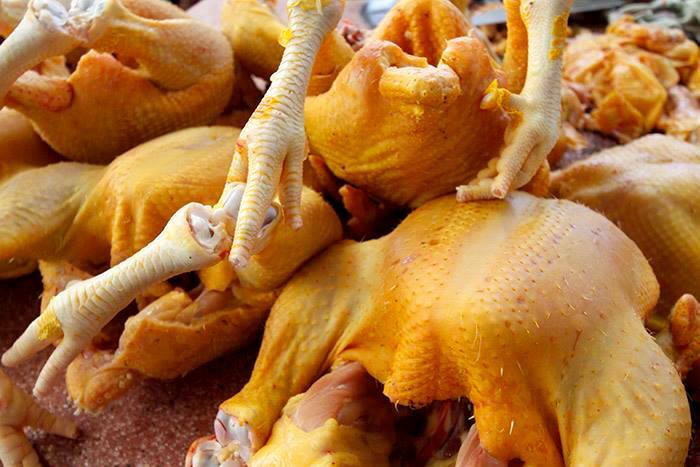 For example, I didn’t crop this chicken in the market photo that Miles took. It’s so close you can see the pin hairs. Donna Howard. Mexico provides so many opportunities for photography. And, I bet Donna got right up to this young boy judging by his expression. Zoom. Zoom. This is exactly as Mary shot this picture. I confess I bumped up the color a bit. Such a beautiful Mexican landscape. They are growing healthy food, here. Kathy Maher Fritz. 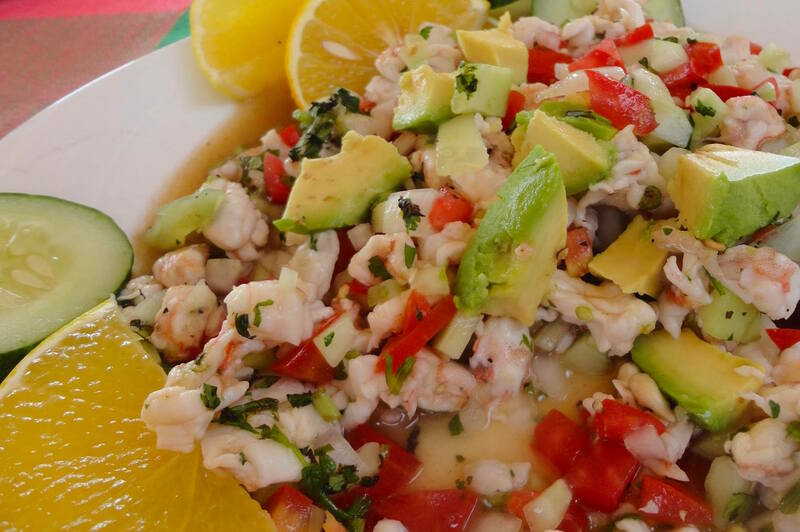 Ceviche at Rocio, Punta Mita. My mouth waters just looking at this! I got in closer on Kathy’s photo so we could see the juice of that orange slice, and yes, says Kathy, the mouth-watering ceviche. Thank you. What’s for dinner? Anyone have a good recipe? Hollie Taylor Novak. Funky, Rusty, Junky. Shannon Pixley Sheppard, Flor de Piña dancers, Guelaguetza desfile in Oaxaca. 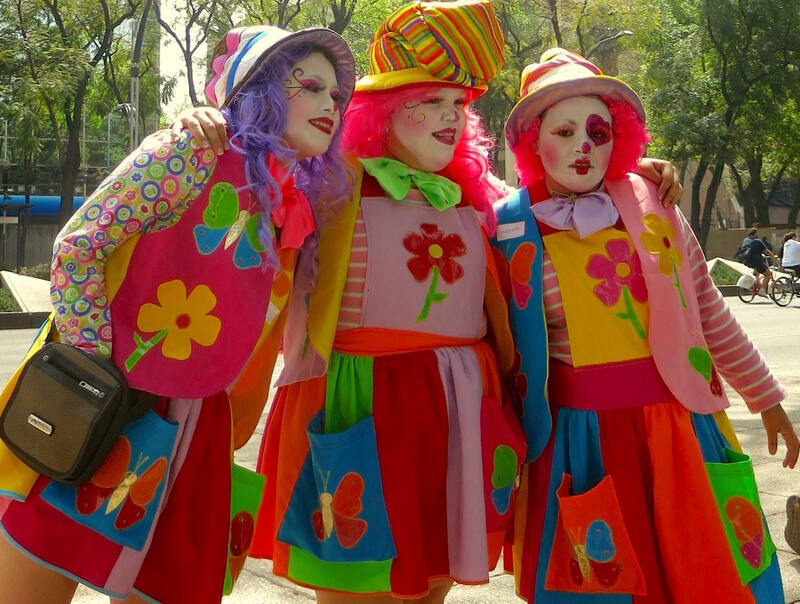 A Oaxaca desfile is a joyous parade. We have them here all the time, and it’s wonderful. Shannon got up close to get the intricate embroidery on the dresses. 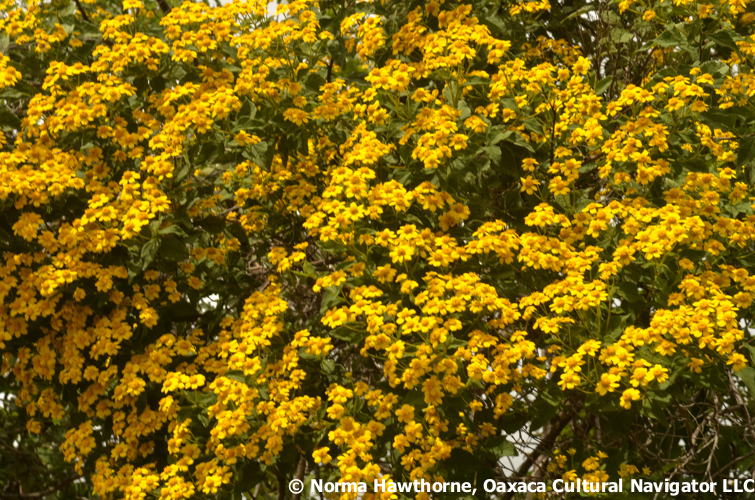 It’s what Oaxaca is known for. Don’t stay away! I wrote to Diane that this looks like a Luis Barragan design. Intense primary colors. Gorgeous. I didn’t touch this one. Love how the right angles contrast with the round trees. Ah, Mexico. Lanita Busher. Semana Santa, Oaxaca 2012. The subject is holding a bull that spits fireworks. 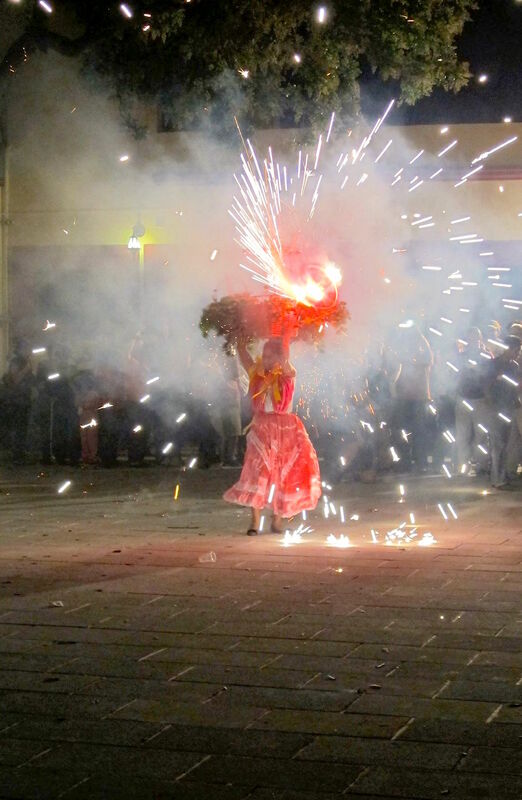 It’s a traditional part of Oaxaca celebrations. We see these at Christmas, especially. Not for the faint of heart, but dazzling. Nena Creasy. 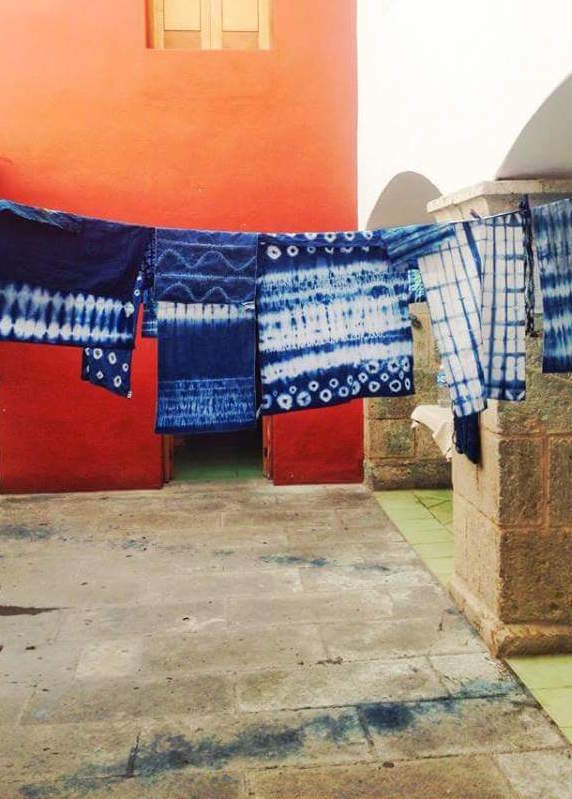 Museo Textile de Oaxaca, dyeing with indigo. Ok, I did a big crop on this one to get our eyes focused on the glorious indigo dyed cloth at Oaxaca’s textile museum, and that amazing red-orange wall in the background. Love that splatter of indigo blue on the floor tiles. 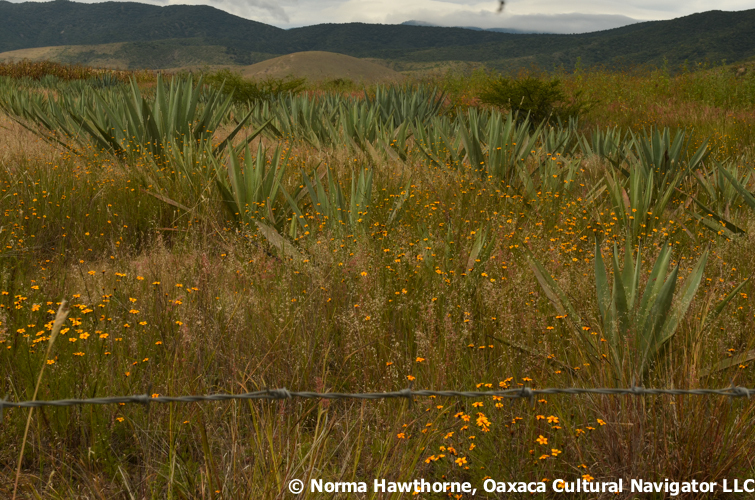 Gad, do you think Mexico could be any more colorful than this? Not likely! Omar Chavez Santiago. 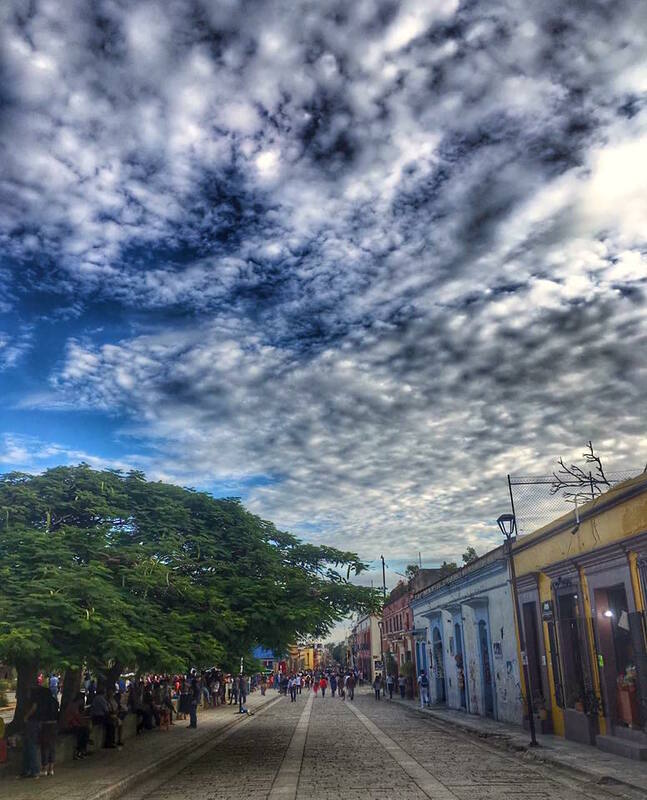 Calle Alcala, Afternoon in Oaxaca. 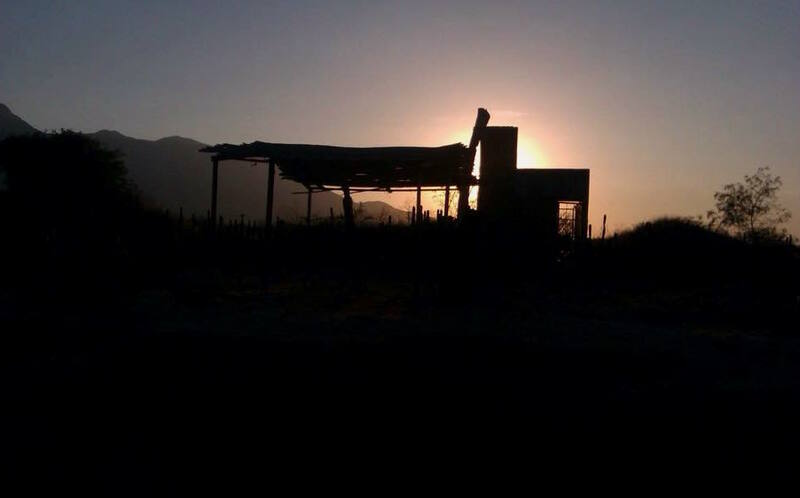 Omar Chavez Santiago sent this one in on the last day of the Challenge. We all loved the sky! Omar is age 22 and is graduating from university this December. He has an eye! Moises Garcia Guzman y de Mendoza. 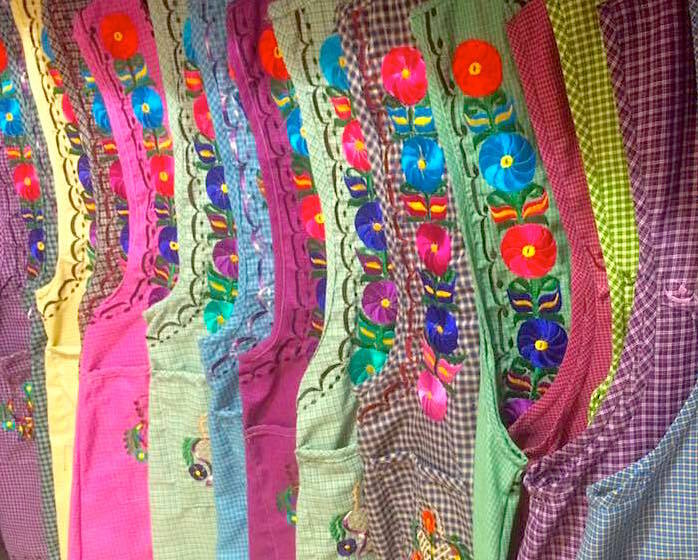 Aprons in the Tlacolula Market… // Mandiles en el Mercado de Tlacoula. And, Moises sent us this one of the ubiquitous embroidered apron worn by all traditional Zapotec women who live in the Tlacolula valley. And, where do you buy these? Why at the Sunday Tlacolula market, of course! I enhanced the color and did a crop so you could see the embroidery detail. Karen Otter. 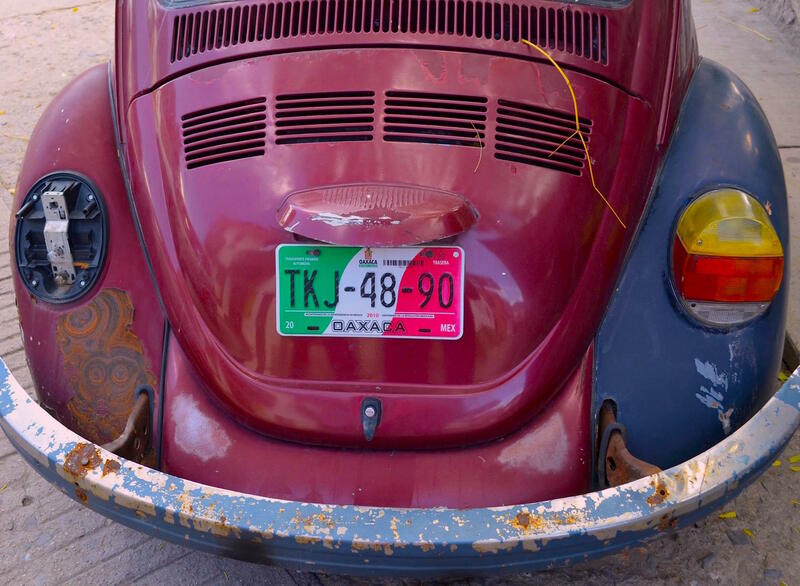 Colors of Mexico. 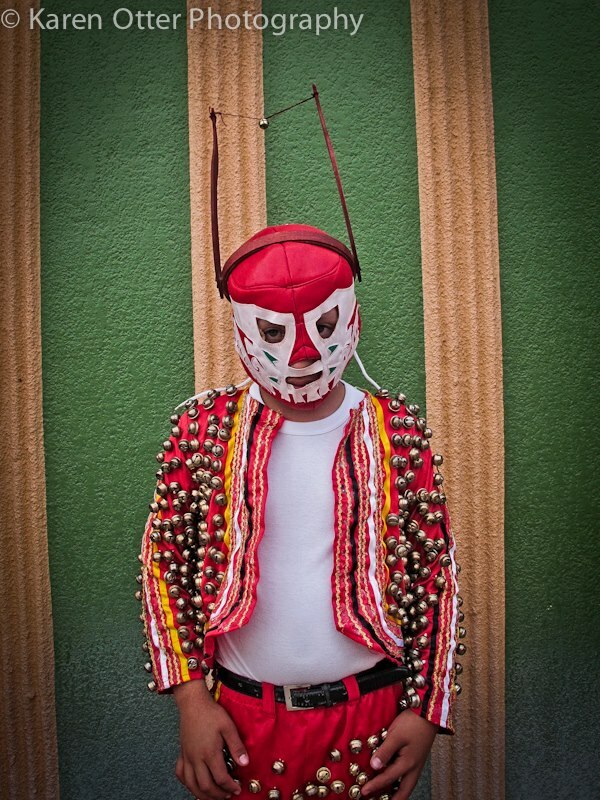 Karen sent us this terrific masked man whose garments are covered in bells! Good enough to eat. 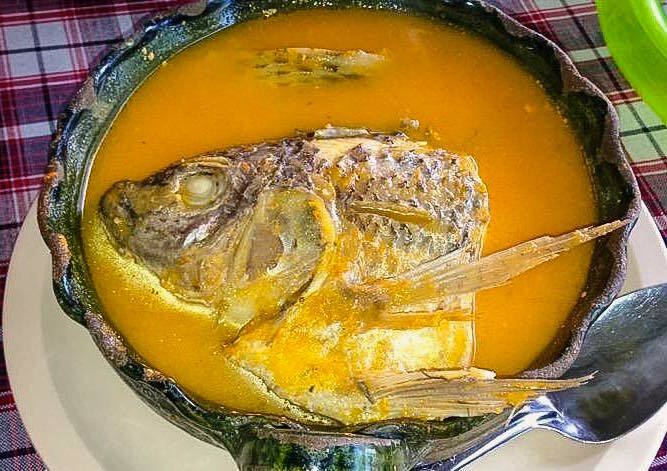 I bet it was tasty, fish head and all. I cropped in closer. Such a great color. Wonder what the seasoning was? Squash? Carrots? Huatulco is Oaxaca’s beach resort. Flights go there direct from the USA. Old here is very beautiful. The textures and layers are a sight to capture. Thanks, Betsy. Claudia Brewer Michel. 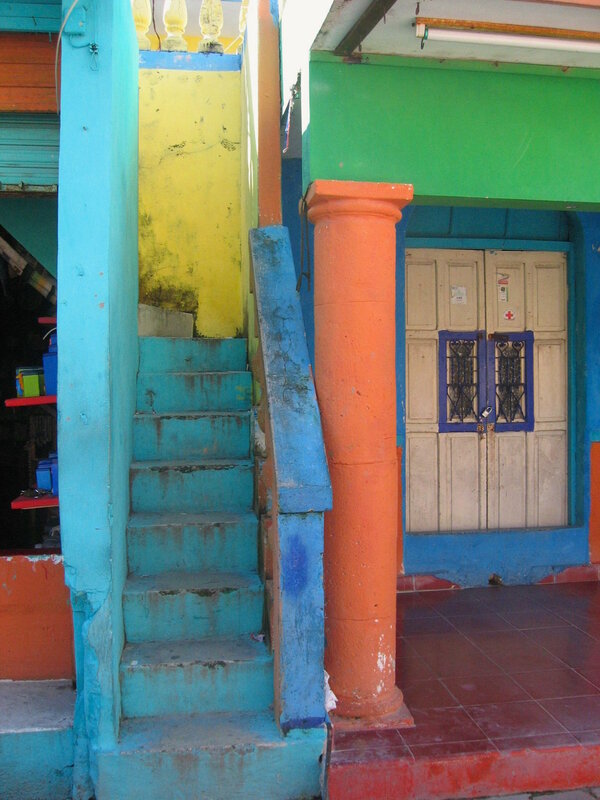 Studio of Jacobo & Maria Angeles, San Martin Tilcajete. 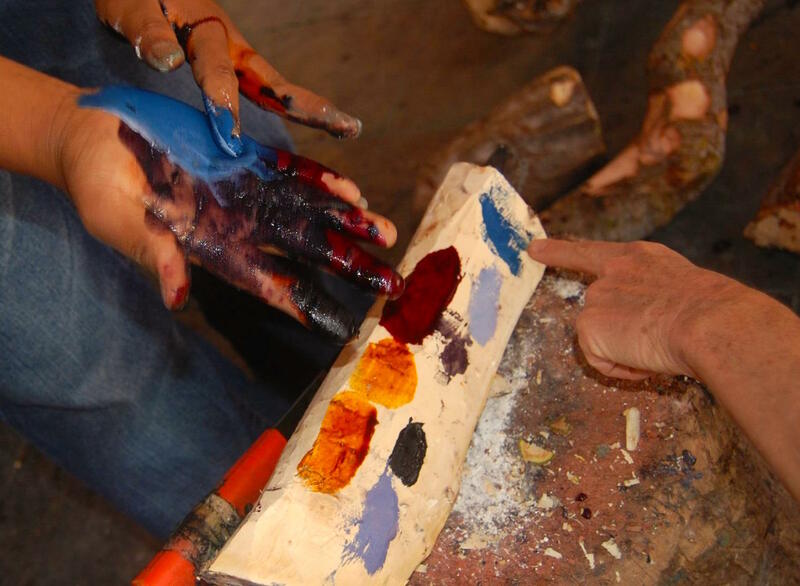 Claudia says, “This is how to make the colors of Mexico.” At alebrije carver-painter Jacobo and Maria Angeles‘ studio, visitors see how natural pigments color carved animals. I cropped to get in closer to the hands. A slimy, beautiful mess. Rene Cabrera Arroyo. Chiles en Nogada from Puebla. 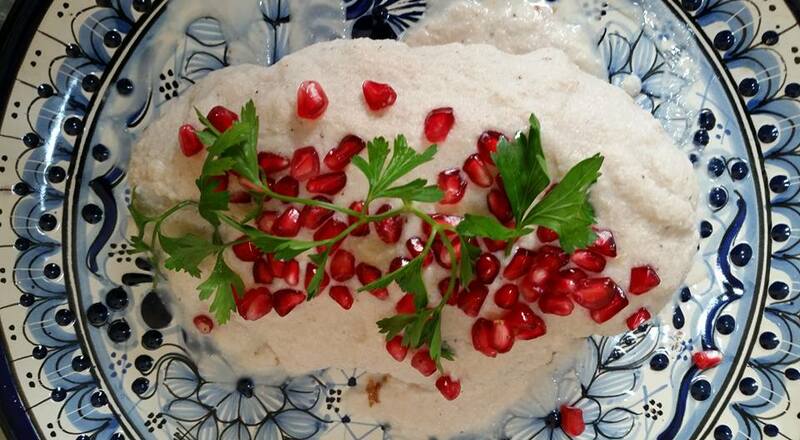 This is the season for Chiles en Nogada, the traditional dish that celebrates Mexico’s Independence from Spain. Red, white and green! Eat it through September. Melanie Schulze. 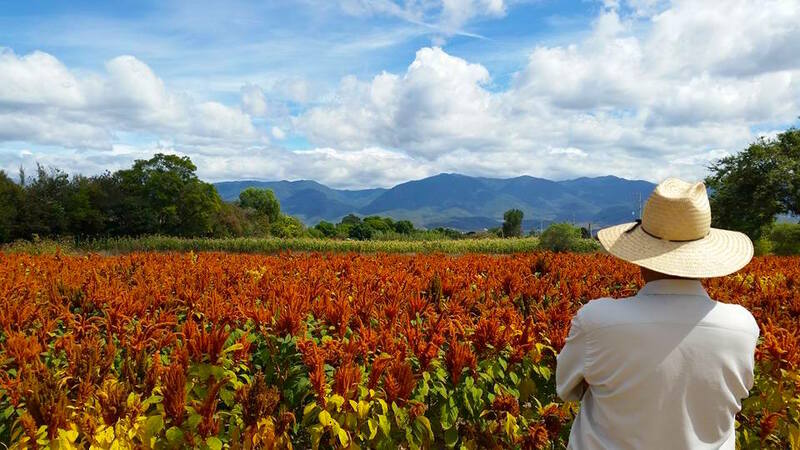 Oaxaca, near Parque El Llano. 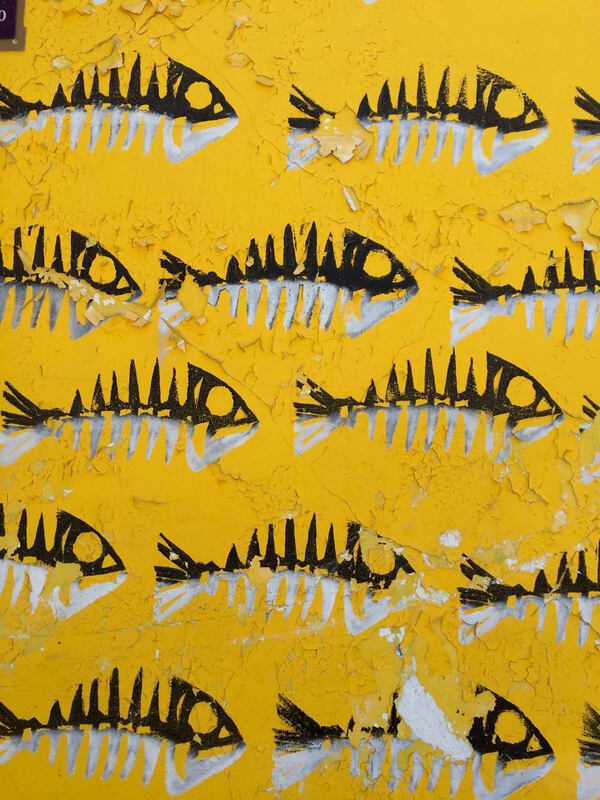 Another take on fish, this time a graphic adorning a wall. Peeling paper and paint. Such great texture. I bumped up the yellow and contrast. Araceli Gonzalez Carrasco. 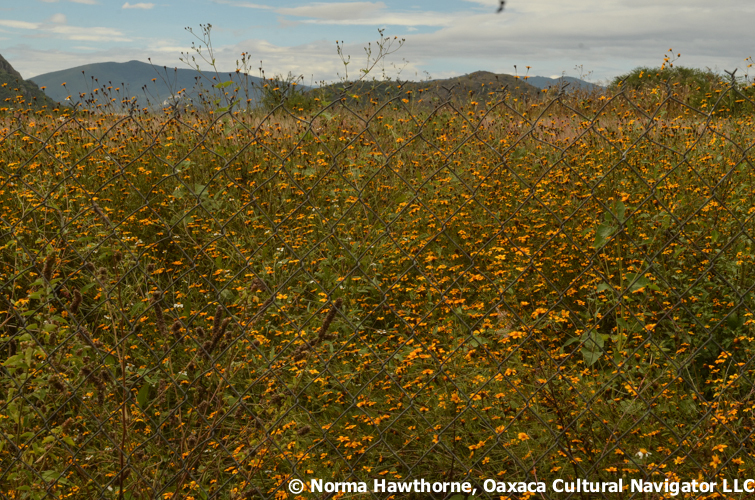 Tanivet, Tlacolula. 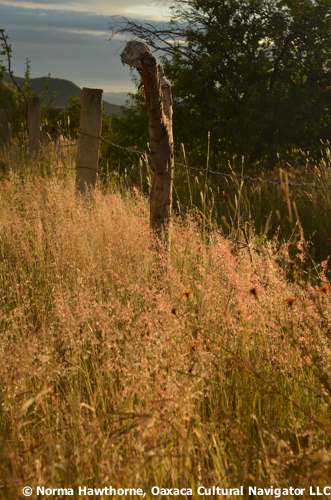 Sunset in the Tlacolula valley. Such a beautiful silhouette. Thanks, Araceli. Nick Hamblen. 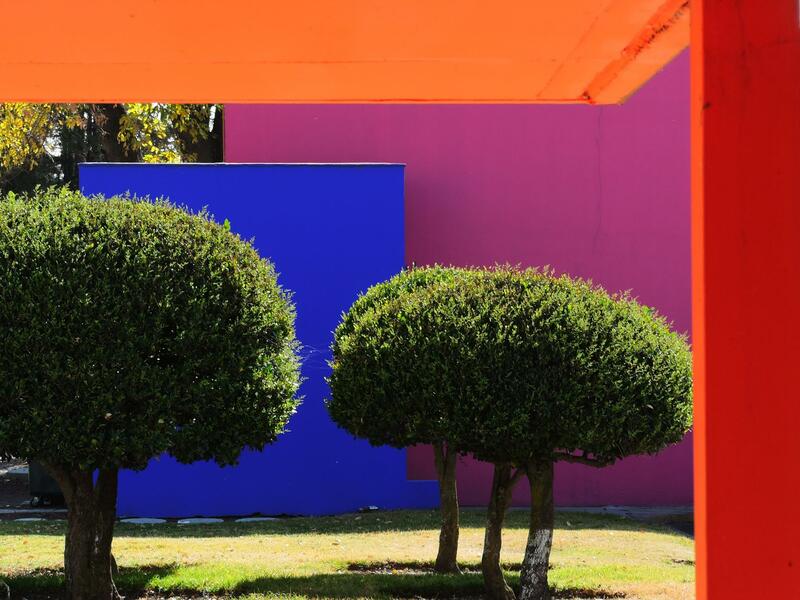 Colors of Mexico. Nick sent this one among several over the week. I loved the shadows, the rust, and the color contrasts. I couldn’t decide between this one and the Mexico City subway scene. It was the blue that did it. Gail Schacter. Day 2, Colors of Mexico. Gail sent us this one on Day 2 of the challenge. I cropped in to get us closer to the faces of the children, and highlighted the color. Wanna red lollipop? Maybe Bob will tell us where he took this photo. 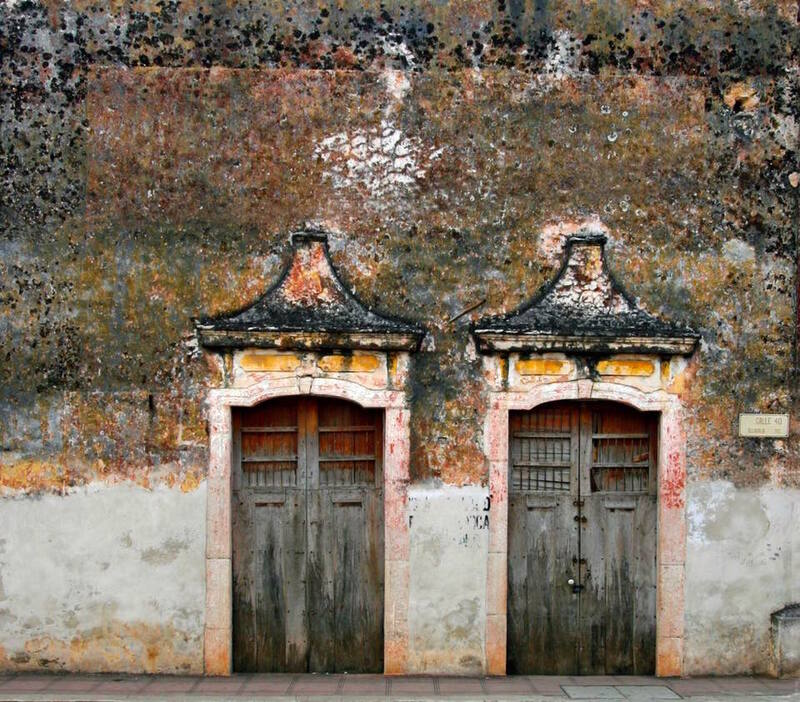 It’s the stippled walls that really pop along with those beaten down doors that might have a few more years left in them. What stories these buildings could tell if they talked. 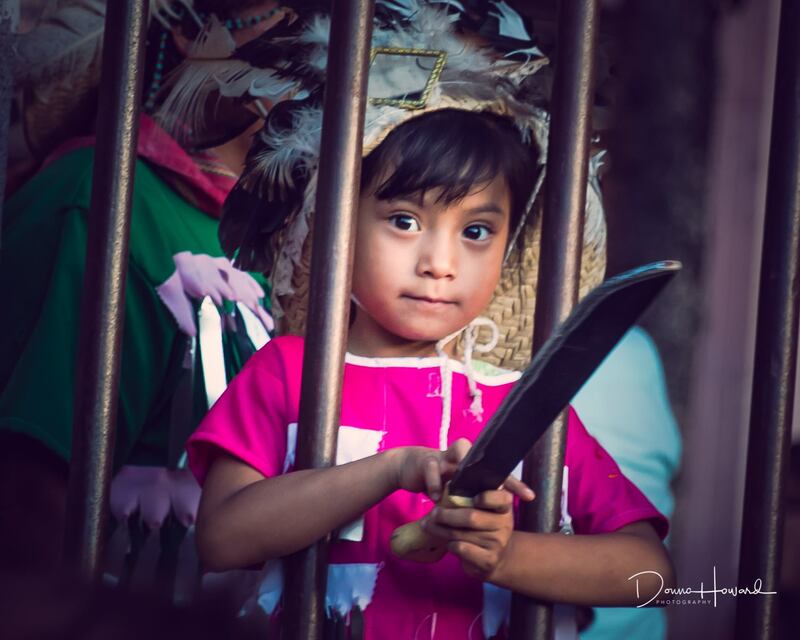 Please take a look at Mexico Travel Photography Facebook Group to see the work that everyone submitted. We’ll do another challenge soon. If you aren’t yet a member, please join. 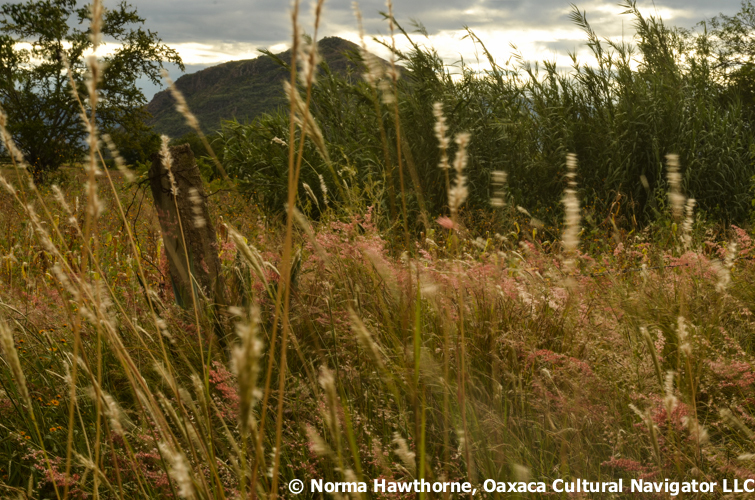 Most of us are amateurs who just love to take photographs of Mexico, her places and people. 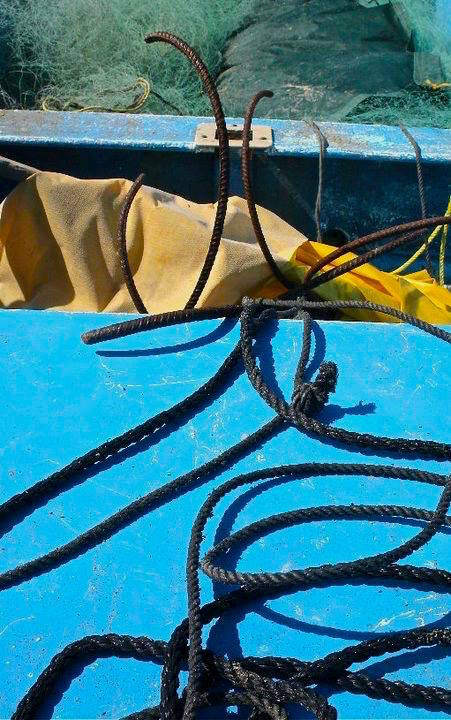 How to Correct the Image and Crop a Photo: Download your photo. For simplicity, take a Facebook photo and download it. I use a MacBook so I click on the download and it opens in Preview. Image Correction: You then use your cursor to open Tools on the Toolbar above. Click on Adjust Color. A screen pops up. 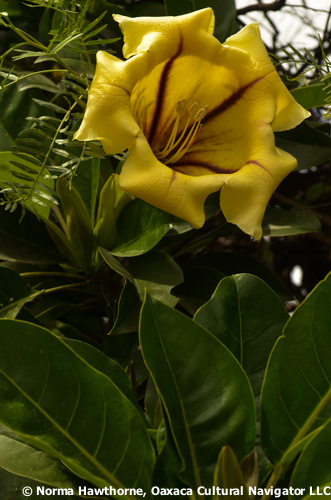 Use your cursor to slide the levers to change exposure, contrast, shadow, highlights, saturation, and sharpening. To Crop, put your cursor on the photo and click the touch pad. A square will come up that you can adjust to decide the area you want to cut. It’s all an experiment and you won’t ruin anything. You can always revert to the original and start over! 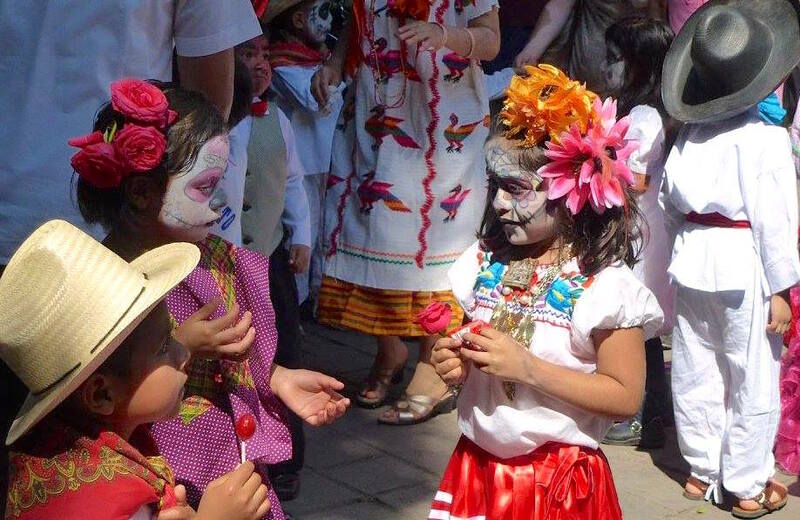 Wherever you are, I invite you to send me your Dia de los Muertos Altar photos. They should be no larger than 150 KB and sent as an email attachment (any larger and they won’t be considered). One photo per person! They need to arrive in my inbox by midnight, November 1, 2013. 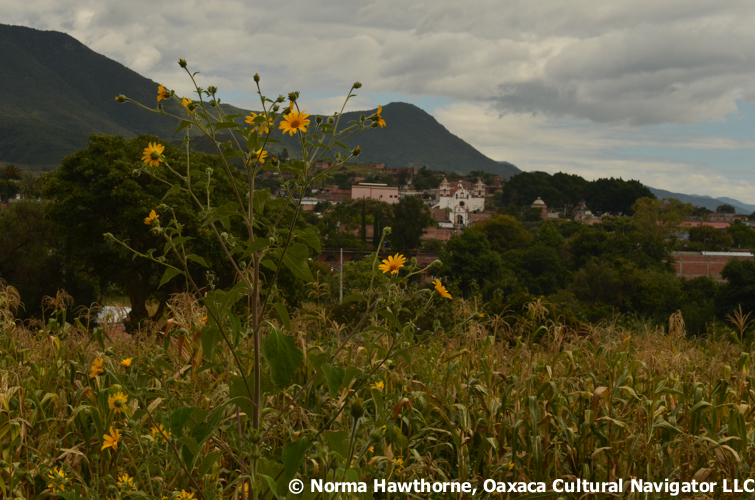 I will ask our Day of the Dead Photograph Expedition participants to select 10 for publication here! Meanwhile, here’s the start for my altar! For my Virgin of Guadalupe, I have a flying saint sending blessings over the campo. It is a lithograph by Oaxaca artist Francisco Olivera. Of course, there is a bottle of mezcal and soon we will add a photo my father who died in 1997. My sister is bringing it on October 30, just in time. 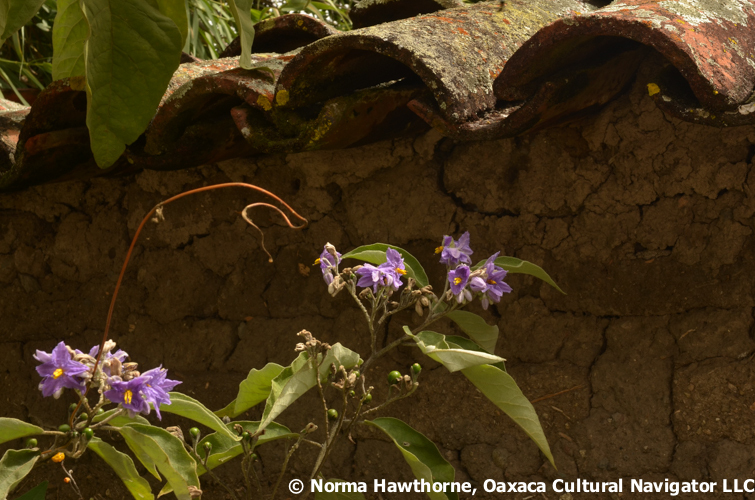 My friend Lupe went out in front of the casita where I live and cut fresh cempasuchitl for the vase. I added chocolate made by Magdalena, Oaxaca mandarin oranges, and two candles. Lupe added the little apples that she says taste like strawberries. 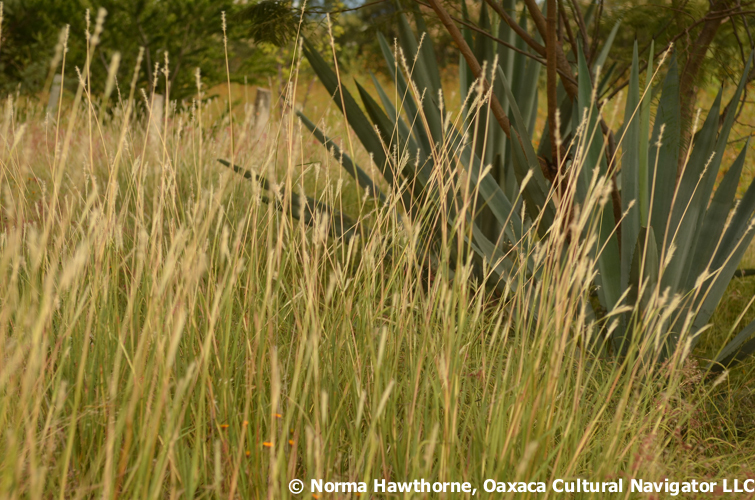 There is a field of agave for mezcal next door. 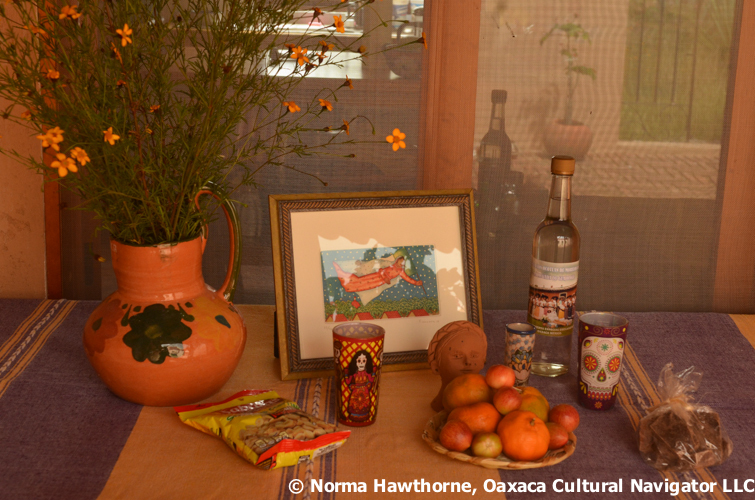 When I’m in Oaxaca tomorrow, I’ll get papel picado cut paper streamers, bread, nuts and copal incense to add. We will need candles under the table and a palm arch so that the spirits can enter and exit with ease. There are three levels to every Day of the Dead altar. As I get ready for the photography workshop, I went out into the fields near where I live to practice my f-stops in the late afternoon light. Here are some photos to share with you.